villa of 240m2 on a property of 15,000 m2 with swimming pool, located 5 minutes from the beaches and the center of Biarritz. this house is open to the outside: large open living room, patio with plancha and barbecue. Near the Basque Country, its gastronomy, its landscapes, its heritage culture. Close to attractive beaches by the quality of the waves for the practice of surfing. Near Biarritz, Saint Jean de Luz, Guéthary, Bidart. Surrounded by 9 golf courses from Capbreton to San Sebastián. We have been coming to this house every year for 4 years now and hope to keep coming back. Great location in Bidart, close to Biarritz and St Jean de Luz with easy access to the motorway. Lovely big house with all the facilities you might need, including spacious parking and a nice pool. Very friendly owner who is always ready to help with anything you might need. Great outdoor cooking and dining area. Easy access from Biarritz airport. Highly recommended. 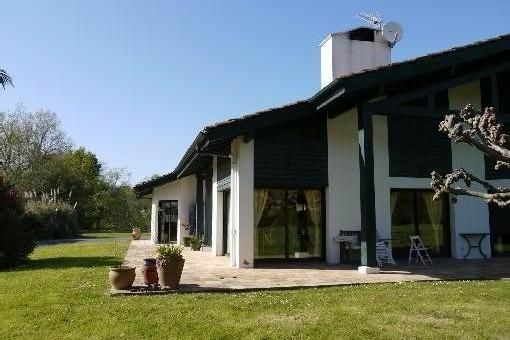 Belle maison, mais entretien à revoir , literie, électricité, nettoyage , mobilier, piscine agréable terrain super, location mal entretenue et situation pas assez précise . Dit groot en aangenaam huis is ingericht met mooie antieke meubelen en een bijzondere collectie hedendaagse schilderijen. Aan het groot zwembad in een goed onderhouden park kom je helemaal tot rust. Vriendelijke ontvangst. Een super adres!